Teak deck care, looking after your teak decks is never easy, there is always going to be some work involved. Everybody has their own opinion on teak decks and how to clean and how they should look. Some like their decks grey looking some like the new and vibrant appearance. Whichever it is MVS are here to help you, should you be un-shore on how to keep clean or if to treat your decks with a sealant. 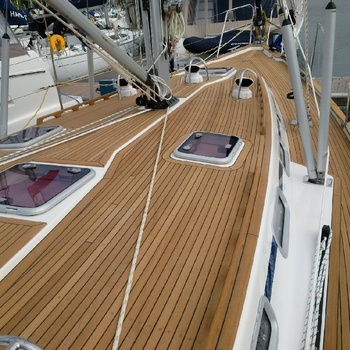 We apply several types of teak sealer which we have used over the years, Which one you may ask, once we know how you spend your time on the boat and the frequency you use your boat, we can assess and advise and suggest a sealer that would meet your needs. Cleaning your Teak We would not advise that you clean or have your teak cleaned to often, a soft brush every once a month with soapy water should survise. Scubbing the teak to often will leave the surface grained and will eventually require sanding. Deck Sanding We can Sand back your decks once they have become to grained. Graining is like a vicious circle ,understanding teak is part of solution. Graining is when the soft grain is taken out by over brushing leaving the surface uneven and grooved. The water sits in the grooves for longer than before making the grain soft even quicker .The only way to undo this is either new decks or by sanding and then keeping up a care regime . Sanding is a far cheaper option than new decks.